Producing intuitive systems for the directing of virtual actors is one of the major objectives of research in virtual animation. 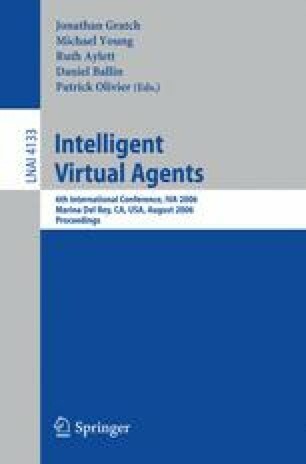 So, it is often interesting to conceive systems that enable behavioral animation of autonomous characters, able to correctly fulfill directives from a human user considering their goal and their perception of the virtual environment. Common ways to generate behaviors of such virtual characters use usually determinist algorithm (scripts or automatons ). Thus the autonomy of the characters is a fixed routine that cannot adapt to novelty or any situation not previously considered. To make these virtual actors able of adaptation, we propose to combine a behavioral framework (ViBes ) and an evolutionist learning system, the Learning Classifier Systems . Using classifiers systems we managed to make a virtual human to learn to select and to cook an aliment in order to eat something. The association of ViBes framework and two trained classifiers systems produced the following real time animation (fig. ) in a dynamic virtual environment.